You never know what to expect at Silver Lake Wine...last Sunday it was pizza from Tomato Pie, and now the hot dog cart from Let's Be Frank will park in front of the store at this Thursday's tasting event. Let's Be Frank, which usually roosts on the Westside, serves grass-fed, therefore guilt-free beef hot dogs and brats with no nitrates. Don't forget to order them with grilled onions for the best effect. Waiters and Waitresses are not making what they used to. Perhaps you gave too much to Obama. (Like he needed it. He had Soros and Geffen millions). Anyway, I digress you've been stiffing your waiters. If you are not going to give decent tips, then don't come. Waiters don't want to work for free. hm, what is this comment about? I'd love to try Let's Be Frank tomorrow, I'll see if I can stop by if I do the thursday night tasting. So what is the appropriate tip at a hot dog cart? Okay, I don't know the context of Kolchak's comment, but whatever it is, servers (waiter is perhaps an antiquated term) don't deserve every penny of their tips, they have to earn them. You're still getting paid minimum wage in California so you can't complain like servers in other states that get paid less than that and REALLY have to live off tips. Heck! I didn't reserve for the tasting! Can I still buy a dog??? Actually, Kolchak, the hourly wage that servers get paid is taxed against our tips. In other words, whatever tips we claim are taxed and that is taken out of our paychecks. And we have to claim tips (enough based on what our sales are) or else this becomes "allocated tips" that we pay taxes on at the end of the year. So, a two-week paycheck is typically $90 or so for 5 shifts a week. We DO rely primarily on tips. Sorry Kolchak, I meant to direct my post to "mattatouille". 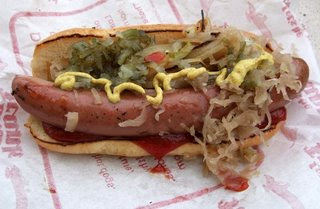 back to hot dogs...I had a Let's Be Frank dog one night on the pier (during the music series) and wanted to love it. I really did. But...it just didn't move me. Not much flavor, decent snap. The grilled onions were good but cold. So you're telling me every server in the city reports exactly all of the tips they earn so that they can be taxed the correct amount, right? (I guess with credit cards that's tougher to do). I still stand by the statement that you should earn your tips, if they truly are your wages. I'm not advocating zero tip - I think that's unconscionable, but don't expect 18-20% after tax (btw, tips should be calculated BEFORE tax) if you give crummy service. And table service, while certainly no easy affair, no not hard to pull off if you have a cool head and focus at your job. Diners have the responsibility to be polite, graceful, and understanding, but servers need to respond in kind. That said, I almost never have bad service at restaurants because I know to treat servers well (and tip them well). Call it karma, or just call it being sensical. Oh, back to the hot-dogs, I will try my best to stop by tonight. The press that Let's Be Frank has gotten on the blogosphere is simply amazing.